Rabindranath Tagore (1861 – 1941). Indian poet. The first Asian poet to be awarded the Nobel Prize for Literature – for his ground breaking work – Gitanjali. Rabindranath Tagore was Asia’s first Nobel Prize winner. He was awarded the Nobel Prize for literature in 1913 for his book Gitanjali. 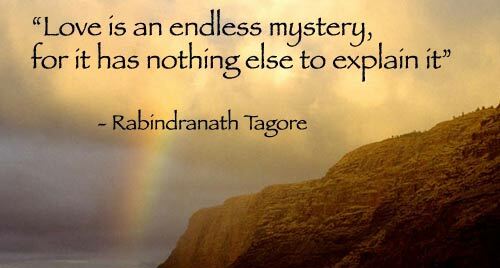 Although most famed for his poetry, Tagore was a creative genius who played a crucial role in the cultural renaissance of India and Bengal in the 19th and early 20th Century. As well as being a Seer poet Tagore’s achievements included notable contributions in the fields of music, literature, plays, art and education reformer. Tagore was born in 1861, the youngest son of Debendranath Tagore and Sarada Devi. Debendranath Tagore was himself an influential Bengali and member of the Brahmo Samaj. Although very wealthy he had an underlying spirituality, qualities which to a large extent were inherited by his youngest son Rabindranath. As a young boy Rabindranath Tagore was asked to sing by his father. Debendranath was so impressed with the soulfulness of his singing that he credited his son with a valuable gift. Rabindranath wrote his first poem at the age of 6 and as a young boy studied the classical poetry of Kalidasa. He also studied the Upanishads, languages and modern sciences. In 1878 he travelled to England in the hope of becoming a barrister. However in 1880 he left University College London and returned to India because his father had arranged his marriage to Mrinalini Devi. Thus Tagore returned home to get married and look after his family’s estates. This enabled a productive period of writing poetry, plays and short stories. In 1901 Tagore moved to Santiniketan (West Bengal) where he found an ashram, dedicated to returning educational traditions of ancient India. Later this school was to be expanded and given the name of Shriniketan ‘ “Abode of Peace” This project was dear to Tagore’s heart throughout his life. This prestigious award brought Tagore into the public eye in both the East and West. He now often travelled to the U.S and Europe to share his poetry and raise funds for his own ashram. Tagore was held in high regard by fellow Bengalis and Indians and In 1950 his song Jana Gana mana was adopted as India’s national anthem. In many respects he was one of India’s foremost cultural figures but he rarely intervened in politics directly although he did share his view at certain times. Tagore had a complex relationship with Mahatma Gandhi. On the one hand he supported India’s Independence movement and shared Gandhi’s vehement opposition to the treatment of the ‘untouchables’. Tagore also famously renounced his knighthood in protest over the massacre at Amritsar. However Tagore did not always share Gandhi’s methods and opinions. For example Tagore publicly criticised Gandhi’s ‘Swaraj’ protest movement he called it the ‘cult of the chakra’ However the two remained close and it was Tagore who was able to persuade Gandhi to give up a ‘fast unto death’ over the treatment of the untouchables. However Tagore also infused his poetry with his own unique creative spirit. In particular he sought to bring the unity of nature into his poetry. For Tagore beauty and beauty’s appreciation was an important part of his life and sadhana and this was reflected in his poetry. Tagore kept writing poetry throughout his life. In the evening of his life when he suffered various illness, he became concerned with the theme of death and man’s immortality. or with whom – of that we are unaware. In 1940 Oxford University arranged a special ceremony in Santiniketan to honor the poet with Doctorate Of Literature. Tagore passed away on 7th August, 1941 in his ancestral home in Calcutta, the house where he was born. Tagore influence many poets and literary figures. Early admirers included W.B.Yeats and Romain Rolland. His poetry was also appreciated by Spanish poets such as nobel Laureates: Gabriella Mistral, Pablo Neruda and Octavio Paz. (4) Dutta, K & Robinson, A (1995), Rabindranath Tagore: The Myriad-Minded Man, St. Martin’s Press, ISBN 0-31214-030-4.